The newly-appointed "President of Europe", Herman Van Rompuy, is a longtime TypePad customer. He's filled his blog with speeches, political articles, book reviews, notable quotes and even his own haiku poems. Visit his blog at hermanvanrompuy.be. Happy Thanksgiving to all our our US readers! We'll be relaxing with too much turkey pie our families after a super-busy time launching cool new stuff. But as you know, there's always more we're up to, so stay tuned. At Six Apart we have a long history of developing leading class open source applications and supporting developers who contribute to the open source community. Our latest community microblogging application, TypePad Motion, has been extremely well received since its launch over a month ago. As these communities have grown around TypePad, so has their need for better community management and social integration. Our members have given great feedback on features and improvements they would like to see, and we've listened! Today we are excited to release TypePad Motion 1.1, with all new moderation and syndication capabilities built right into the application - and that is on top of the awesome performance improvements. We strongly recommend all current TypePad Motion users to upgrade their application to the latest release. Moderation: A moderation tool is now included with TypePad Motion. Administrators can select to review all posts before they are published, or enable selective moderation (by post type such as text, picture, audio, video or a combination thereof) and community policing. Flag a Post: Community members can now flag and identify inappropriate and offensive posts. This is a powerful mechanism to help keep our online communities free from spam, griefing and generally bad behavior. Performance Improvements: Taking advantage of the TypePad architecture, TypePad Motion now supports template and object caching, which means community sites are faster than ever, with improved page load and data access. Bug Fixes: We also fixed some minor issues on local profiles and registration. Documentation: Read the updated documentation to install and configure moderation, with additional instructions for community managers using moderation tools. Download: For our developer community and open source affictionados, here are links to the TypePad Motion download pages on Github, Pypi and our own TypePad Developer Resources. If you want to make someone special in your life happy this holiday season, why not make a book out of your blog with Blurb? It's easy, and they've got a special promo from now through November 24th for 20% off plus free shipping. Give the gift you know they'll love! Last week, Andrew and Matt from Six Apart's New York office gave a talk about TypePad Motion to the Django-NYC group. They gave a demo of the application, explained the basic infrastructure of TypePad Motion, demonstrated the installation process and explained the details of Motion's internals, including BatchHTTP and RemoteObjects. If you'd like to watch the talk, we've posted the full hour here. It's the perfect time to curl up with a hot chocolate, a box of Nilla Wafers and watch the whole episode after the jump. So you've tried out the new TypePad Motion and now you're ready to run a large public community site. That is great news and we're here to help you! We just added a guide on using mod_wsgi to run production scale communities on a stable Web server environment. We hope this guide helps you run more public, stable Motion sites using mod_wsgi. If you have trouble or just want to share tips and tricks for running production Motion sites, feel free to share your thoughts with the Community. As part of our ongoing rollout of the NEW TypePad we are pleased to announce new social blogging features and the launch of TypePad Micro: a completely free level of TypePad focused on easy sharing of text, photos, and videos. A new form of blogging is emerging — somewhere between the status updates of Facebook and Twitter and the full-length posts of classic blogs — focused on being easy, fun, and connected. Think of this middle category as a bridge between blogs and social networks, tapping into the connectedness of networks with the freedom, control, and independence of blogs. TypePad Micro is built for this growing form of blogging, making it easy for people to curate compelling content from the web — be it text, photos, or videos — and share it in real-time with people on their blog and to Facebook and Twitter. We very much see this form of blogging as a complement to, not a competitor of, these services. Many bloggers have friends and followers on these great networks but often want to post more than 140 characters, or share photos and videos, with their own narrative and their own design. TypePad Micro comes with a beautiful new theme, Chroma, custom built for this streamlined form of blogging and a new feature: Reblog, which makes it easy for your blog’s readers to re-post items from your blog on a blog of their own (think of it as the blogging equivalent of the “retweet”). If you’re already a TypePad blogger, TypePad Micro is a great addition to the family. We remain steadfastly committed to being the premiere hosted blogging platform for bloggers with the greatest demands, but also realize that a healthy blogging ecosystem means supporting bloggers of all types. You get all the features of Micro in your TypePad Pro account, so you might consider starting an additional blog on your site just dedicated to quick sharing and easy cross posting to Twitter and Facebook (here’s how). Maybe you are a food blogger and want to have an easy way of sharing photos of your meals or snapshots from other blogs, but without disrupting the flow if your main blog. See what Stephanie Quilao of Noshtopia has done with her new Chroma blog. Or maybe you are a marketing visionary and want to quickly curate great posts, charts, and graphs from other professionals on your site and for your followers on Twitter and Facebook, but keep your main blog with your original content separate. We also see TypePad Micro as a great way for you to engage your readers … and their readers. If you add Reblog links to your post footers, readers can quickly share your posts on their own TypePad blog, driving new readership and visitors to your blog. TypePad Micro is the result of a year of huge investment in TypePad, in which we’ve put in place many of the building blocks of social blogging, such as profiles, following, favoriting, a dashboard and activity stream, sign-in and cross posting to Facebook and Twitter, easy posting by email, and a snazzy new bookmarklet. We even released an entirely new open source application, TypePad Motion, for building custom microblog communities tapping into the power of TypePad. And now with TypePad Micro we’re making it easy for anyone to get started with TypePad. No other blog platform combines these great microblogging capabilities — easy posting, profiles, following, an activity dashboard, etc. — with the full capabilities of a world-class, full-featured blogging platform. If you are just getting started and want an easy, fun blogging experience why not begin with a platform that can grow with you all the way? We want to do all we can to support and draw out the fantastic TypePad community, one of the first and largest in blogging. With social blogging, community is a feature — and we’ve got a great one — so we’ve also launched a new TypePad Directory to help people find and follow great TypePad sites and join a growing staple of TypePad Motion communities. If you are a current TypePad Pro blogger, please try out the new Chroma theme (perhaps start a new blog!) and let us know how you like it. If you are new to TypePad, give it a whirl and let us know what you think. We hope you enjoy TypePad Micro as much as we’ve enjoyed building it. Rest assured this is just a first step — we are just getting started! This morning we launched TypePad Micro. Micro is a free streamlined blog, powered by TypePad, and optimized for social media. Encourage your readers to share your content with their followers on their very own free Micro blogs. Reblogged content links directly back to your blog, driving traffic from your readers and their social networks. Add the new Reblog button to your design and they can instantly amplify your best posts. As we continue to make TypePad faster and simpler to use we want to give you a heads up about some changes you will see in our next product update tomorrow. Tired of having to click on the sign-in link every time you visit TypePad.com? So are we. 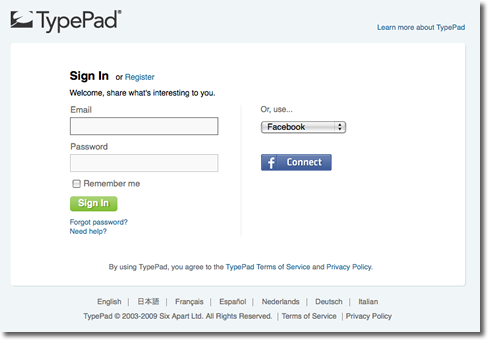 If you're already logged into TypePad you'll be automatically redirected to your dashboard when you visit www.typepad.com. If you do need to sign-in, you'll notice a fresh new look on the sign-in page. To make it easier to quickly share text, photos, or a video we've created a simpler compose box and put it right on the dashboard. Don't worry: the normal compose is still available. The fastest way to a page is a single click so we've added direct links to the most popular blog management pages on the new "Manage My blogs" dashboard. You can quickly access the stats, design, compose, posts, settings, and comments pages, for each of your blogs. We want you to be the first to know about new tips and updates to TypePad. Starting tomorrow all members will automatically follow the TypePad Team and see updates from Everything TypePad in the recent activity feed. You can choose to unfollow us if you'd like. We've got some other exciting announcements coming soon so keep an eye on your recent activity feed and Everything TypePad. We've added a bunch of features to TypePad to connect your blog to the social web to drive traffic and share your posts with your followers and friends. 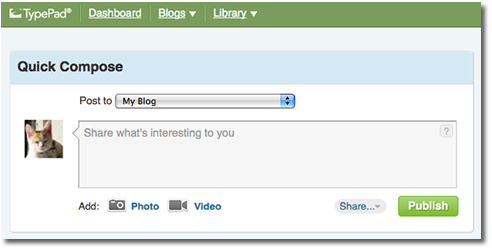 Share your blogs to your TypePad profile and your followers will see your most recent updates. Add the follow module to your blog so your readers can easily follow your latest posts, comments and favorites. Enable Reblog so your readers can showcase your best posts on their own blogs. Add TweetThis to your post footers and your readers can quickly share your posts with their Twitter followers. Turn on Favorites so your readers can show off your best posts to their friends. Setup cross-posting to Twitter and Facebook so that your friends and followers will see your latest posts. Complete your TypePad profile with an avatar userpic and links to your other social networks. And as always, if you need any help setting these features up, please let us know by opening a help ticket with support or leaving a comment below.